I'm not sure whether these are bulkheads or bulwarks - anybody know for sure ? Anyway, I painted the inside white with a spray paint, scratched the paint off the edges and glued them in place with Superglue. I used a viscose (thick) Super glue. This worked fine as it doesn't set as quickly as most of them so it gave me 20 or 30 seconds to get the parts in exactly the right position. The next job is to put a smear of filler in the joins. 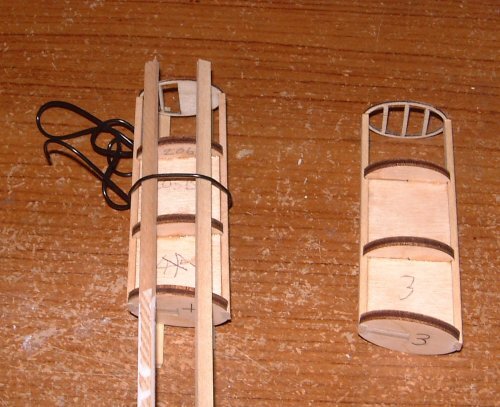 The grills were glued to the funnels. These were quite tricky to get straight. You can see how I used some scrap wood and a length of vinyl tube (left over from another model - a rubber band would do just a swell) to get the grill central. Just a reminder to keep a selection of each type of left-over wood. You never know when you're going to need an od scrap for something.